Imagine waking in the morning and not finding yourself in a hotel room, but instead in a beautiful village home nestled in the medieval quarter of an ancient Italian village, just steps away from an 11th century castle that was once the summer residence of the Pope. You realize that all of your neighbors are local villagers, not other tourists. As you leave your home this morning, you recognize your neighbors who smile and wave. 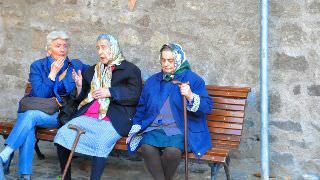 You encounter a village grandmother sitting on a small chair in front of her home who delightfully exclaims ‘Buon Giornio!’ with a warm smile as you walk by. She doesn’t speak a word of English, but somehow you find a way to communicate. Imagine walking into a village cafe’ where the locals are having their morning Cappuccino and pastry breakfast. As you walk in, several villagers smile and greet you. Luciano, the owner of the café, sees you and exclaims ‘Buon Giorno!’ with his huge smile before he takes your order. You sit down and enjoy your traditional Italian breakfast at a table right on the Piazza sidewalk and just take it all in as the church bells begin to ring across the Piazza and the locals begin their day. 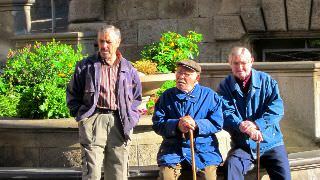 Imagine shopping for food in this small Italian village, walking into the village grocery where you are on a first name basis with Franco, the proprietor. As we are buying cheese for today's class, Franco lets us taste some fresh ricotta and maybe a few olives. Once done, we head next door to see Emore, owner of the village fruit & vegetable stand. We select fresh veggies grown on his farm for our class as we laugh and joke around before going across the way to Teobaldi, the local butcher. We need some salami and prosciutto for today. He reaches up and pulls a huge one off a hook, places it on a carving rack and starts to carve slices out for us by hand. 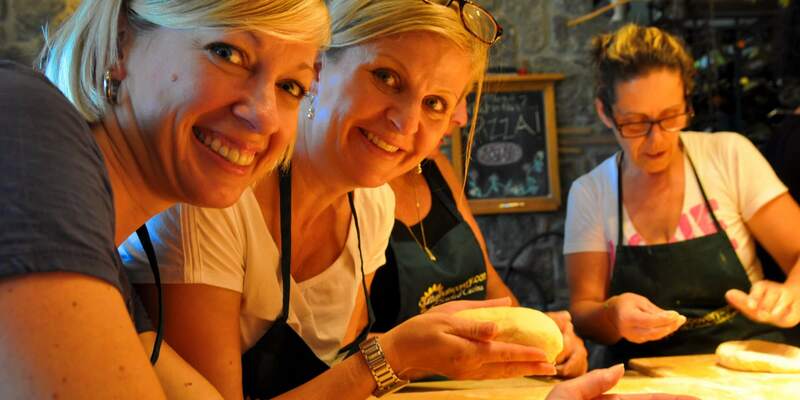 He can't help but carve a few extra for us to taste before we go grab a quick espresso from Luciano's café and head down to the country villa for our cooking class. 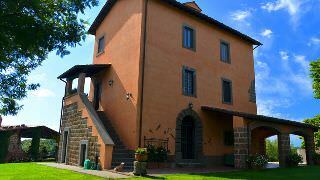 Imagine walking into the 350 year old country villa in the rolling hills of the Tiber valley. As you walk toward the villa you gaze at the hills of Umbria and Tuscany, littered with olive orchards, hazelnuts, and a vineyard here and there. You walk inside and place your bag on a 2,000 year old ancient Roman altar that is now part of a stone fireplace before tying on your apron. 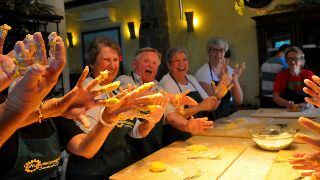 Before you know it, you are laughing the morning away as you make fresh pasta from scratch and all sorts of country Tuscan recipes that have been handed down though the generations in this small corner of central Italy. You feel like a little wine, so you walk over to the rack and select a Chianti, uncork it and share it with your new friends in the class. As class finishes, we all sit down and share the meal we just made as you wonder when the last time was that you laughed so much. Imagine visiting the grounds of a Prince's castle, on which he had gigantic volcanic boulders sculpted into elaborate works of art... 460 years ago. All in an effort to create the 8th wonder of the world. As you walk the grounds and gaze at this truly mystical place, you learn that this is believed by some to have actually been designed by Michelangelo himself, but was lost in forest growth for centuries. You learn about the death of the Prince's wife, and how it drove him to insanity, inspiring this "Monster Park" that is referred to as "The world's first theme park". Imagine finding yourself invited for dinner at the home of a local artist tonight. You arrive at her villa in the hills above town where you are introduced to her family. She invites you to make yourself at home, and you quickly realize that this really is her home, and we really are sharing dinner with her family in her dining room... and it is a meal that she personally cooked for us, by her, in her kitchen. This is not a restaurant or a tourist attraction. We are house guests in this little Italian village and she is displaying the true warmth of Italian hospitality, sharing her home and a wonderful dinner with new friends. Imagine you are here for one of the many festivals held in the village. After dinner we head back into the Piazza and take part in the entertainment this evening. Perhaps there are fireworks tonight, or you are here for the Jazz festival and there will be live music in the piazza. 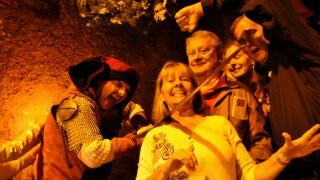 Perhaps you are here for the medieval festival and we will be watching the flag throwers & trumpeters, or the swordsmen, or any of many various performances that happen during festivities in Italian village life. Imagine the evening over, as you call it a night and walk to your village home, think back at the day of incredible, unique and personal experiences that you will treasure forever. Just before getting to your home, you see the grandmother still sitting on her chair. She smiles and waves. ‘Buona Notte!’. You smile back and reply ‘Buona Notte!’. As you close your door, you wonder how tomorrow can possibly top this? Yet, somehow it does. 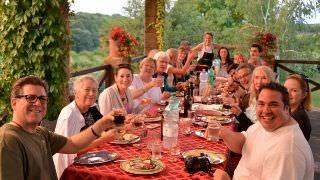 Many of our cooking vacations are based in Soriano nel Cimino, which is right at the border between Lazio, Umbria and Tuscany. While largely unknown internationally, Soriano is just 15 minutes from Italy's major rail lines and the main A1 Autostrada (Expressway). 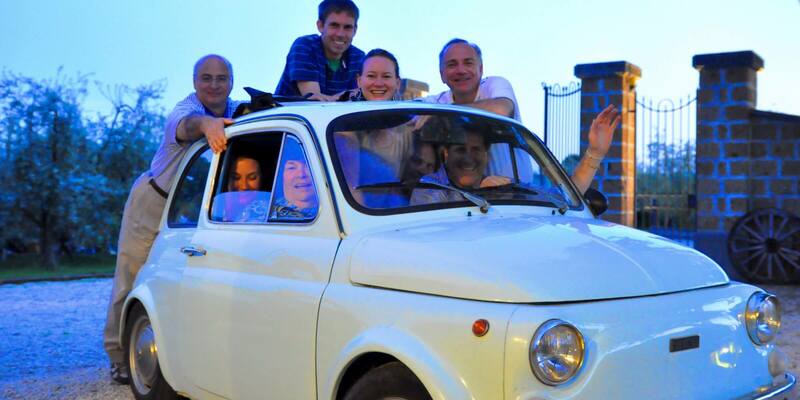 That puts us at an extremely convenient near half-way point between Rome and Florence, right in the heart of Italy and within close proximity to most of Italy's most popular destinations... Rome, Florence, Assisi, Tuscany, Umbria, and much more! The village of Soriano nel Cimino (often simply called Soriano) is one of those few remaining places in central Italy that is still unspoiled by the ravages of mass tourism. 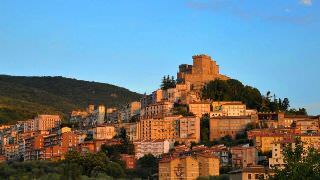 Over the years, mass tourism has overtaken many of the popular Tuscan and Umbrian villages. Where there were once small village grocers, vegetable stands and butchers, there are now rows of shops selling postcards and snow globes. Where you once saw local villagers shopping and strolling, all you now see is crowds of foreign tourists snapping photos of one another. 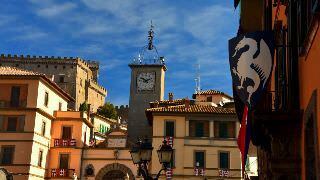 The charm of many villages in Tuscany is gone, as they feel more like Disney attractions than the real thing. on his own farm. You still see the villagers mingling on a Sunday morning before church, and you still see the women walking around doing their morning shopping every day. Soriano is a place where children still are allowed to run free at night, and many still leave their doors unlocked. You feel it the moment you get there. Stunning beauty with an innocent feeling of a time long gone for the rest of us. All of this exists in this amazing place, yet it is still extremely close to all of the destinations so many people dream of visiting. 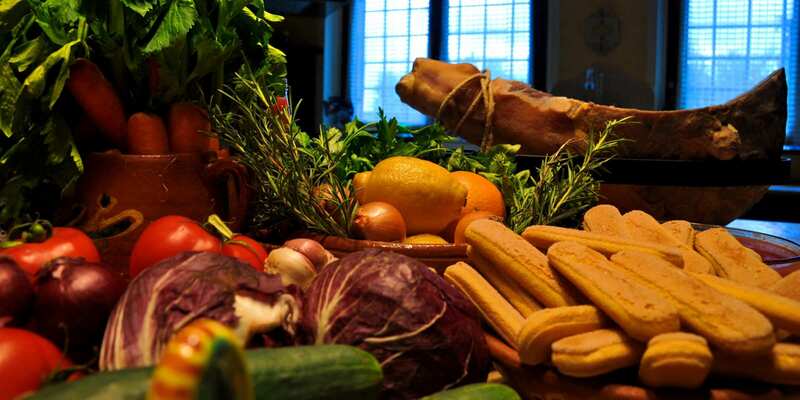 In this way, Soriano offers the perfect balance of actually experiencing Italian life, while still having the opportunity to see the sights you have always looked forward to. 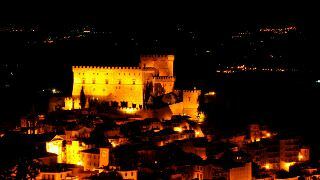 Looking at Soriano, you can see its history expanding outward from the castle. At the center, the castle's main tower dates back to Roman-Etruscan times. 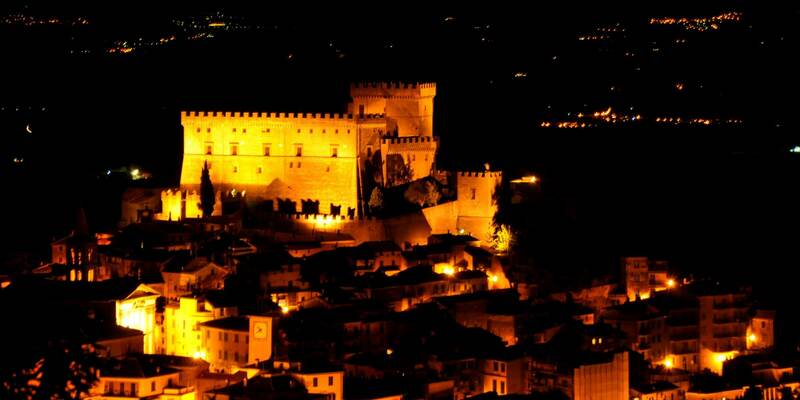 In 1278, Pope Nicolas III built the castle around the tower, where it became a summer papal getaway. It was during this period that St. Francis of Assisi was recognized by the Catholic church... right here in Soriano. A small medieval village later sprung up surrounding the castle. As you look beyond the medieval village, you can clearly see something of an outer ring, which was constructed during the renaissance. Throughout history, Soriano was an important strategic location for its views of the Tiber valley all the way toward Rome. The names that are inscribed in Soriano's history say it all, from the Orsinis and the Borgias, to names such as Dante & Plini the Elder. Today, Soriano is home to roughly 8.000 permanent residents, but swells to roughly 12,000 during weekends and in the summer, as it is an extremely popular summer getaway for Italians, many of whom own weekend getaways and summer residences here. 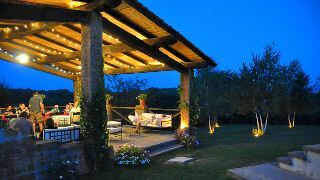 Villa Eddarella is the summer home of Michael and Paola, the founders and owners of Culture Discovery Vacations. The home has been in Paola's family for more than 350 years, after her family emigrated from Corsica to Italy. 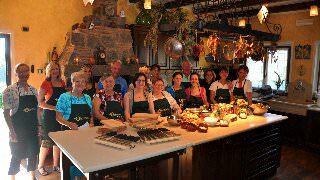 All of our cooking classes are held on the ground floor of the villa. The top two floors are Michael and Paola's summer residence. One of Paola's ancestors was a doctor who had delivered twins for a countess in Soriano by caesarean section, a method that very few doctors of the time practiced. As payment, the doctor was granted thousands of acres of land beneath the town. From that point forward, and until the middle of the 20th century, the family were land barons and this home had been one of the residences where families of farm-servants lived. During World War II, the Nazis had occupied Soriano. In doing so they ousted Paola's family from their "Palazzo" in the town piazza in order to use it for offices. They had chosen to live in one of the family farmhouses, and this was the one they chose... a choice that probably saved the family when the Americans bombed the main piazza on June 5th, 1944 as they liberated the town from the Nazis. The home continued to be inhabited by a family of farmer-servants until the 1980's, and with time it fell into disrepair. In 1999 Paola's mother, Edda (often referred to as Eddarella), passed away and left the home to Michael and Paola. Almost immediately, they began a total renovation on the home by completely gutting the house out and rebuilding it from the inside out with original regional design and authenticity in mind. After a few years, the country house was named in Paola's mother's honor as Villa Eddarella. Today they spend their summers living in the top two floors of the villa, while the bottom floor is dedicated to the cooking classes. Until 2007, all of our classes were done in our second floor kitchen, but we wanted more room. There was an ancient 700 foot stable attached to the house, and we decided that it would get much better use as a kitchen. So we designed what we felt would be the ultimate kitchen to teach and learn in... naturally respecting the beauty of Tuscany and Umbria! In July of 2008 it was finally done, to to say this kitchen is breathtaking is a complete understatement. The room is divided in half by a crumbling stone wall, on one side is the kitchen section with solid-block travertine marble counters, a hand-carved travertine marble sink, custom hand-painted tiles, etc. Hanging from the rack above the 12 foot center counter, you will find salames, onions, garlic, etc. Over on the far side we always have a complete prosciutto there to pick on at will. On the other side is our dining area. As you walk up the steps between the two, it is impossible to miss our 90 bottle wine rack that you will have complete access to any time you desire! Just outside the door, the view is simply unmatched. On one side you look toward the Tiber Valley, and the other toward the hills of Umbria. 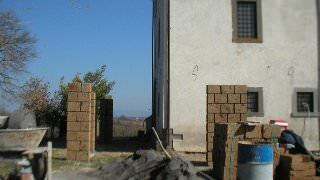 It is said that a true Italian construction project is never complete, and ours is no exception. In 2011 we started (and somehow completed) the next phase at the villa: An 800 square foot terraced outdoor patio area with an attached outdoor kitchen, and a wine & cheese cellar beneath it. At first, we jokingly called it "The Tuscan Tiki Hut", but later began to refer to it as the "Cabana Toscana". This was a very different project, and all of the locals thought we were crazy! Since Italy is so full of antiquity, when most Italians build new structures, thy like to go with a more modern style. We, on the other hand, wanted to build something that looked like it was hundreds of years old, using ancient materials. In other words, we wanted it to look like some ancient building that we merely propped up. To make this happen, we had to find materials from ancient structures, and literally create a new building from the old. Local farmers would come down and shake their heads. Even our architect got frustrated at us for not wanting modern beams and perfect angles. But when it was all done, everyone agreed: It was a masterpiece. The crown jewel of this new project is, of all things, the oven. 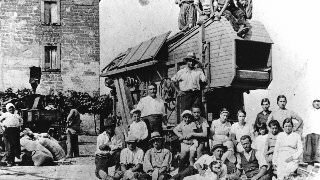 Attached to the outdoor kitchen, we wanted a big brick pizza oven, but we wanted it to be exactly as it would have been hundreds of years ago, had a poor farmer used it for the family's bread. 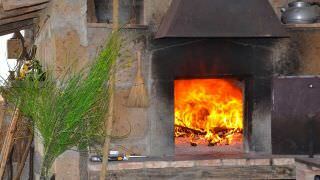 Unfortunately, the materials to build a centuries old oven no longer exist. No problem! Our contractor was able to find -- and acquire -- a 500 year old oven from an ancient house nearby. He broke it down carefully and rebuilt it, stone by stone, at Villa Eddarella. This is the oven in which we will bake our pizza for our pizza class, roast our Tuscan Roasted Chicken, and much more! We built a 400 square foot cellar, which is home to so much more than wine. 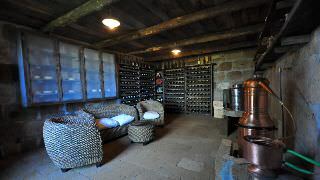 While you will find a wonderful collection of Umbrian and Tuscan wines here, we also use the cellar for other "projects". Here, we age cheese as well. When we make Ricotta cheese together, we take some of the "Cacio" cheese that is part of the process to make Pecorino cheese that we age here. We also age our prosciutto and salami in the cellar. Finally, our newest project involves a pot still, with which we make our own Grappa on site. While all of our guests stay in town, Villa Eddarella is 2 miles (3.5km) as a crow flies from the village of Soriano. It is perched atop one of the rolling hills of the Tiber valley, just outside of town, among olive and hazelnut orchards. The views from the villa are breathtaking, making it the perfect setting for days of Italian country cooking & relaxation. On days that we have cooking classes in the morning, we all have breakfast together in town before boarding our minibus for the five minute drive to the villa. When our cooking classes happen in the afternoon, we simply head here after our morning excursions. While you will have your private village home in town, one thing is common among all of our guests. Villa Eddarella becomes home. From the moment you first arrive here for the first cooking class, you will quickly get into the rhythm: Our house is your house. When you are at the villa, you will find that you are truly our house guest for the week. Feel like some wine? Just get a bottle from the wine rack. Thirsty? The refrigerator is yours to raid. Want some coffee? Just go ahead and help yourself. We do everything we can to make you feel completely at home, so it simply becomes 'home base' for everyone. To learn more about the destinations we visit on this vacation, have a look at our FAQ pages about destinations we visit from Our Soriano location. 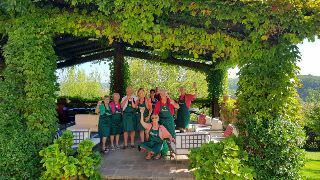 To learn more about the unique cultural experiences we encounter on this vacation, have a look at our FAQ pages about cultural experiences at Our Soriano location. 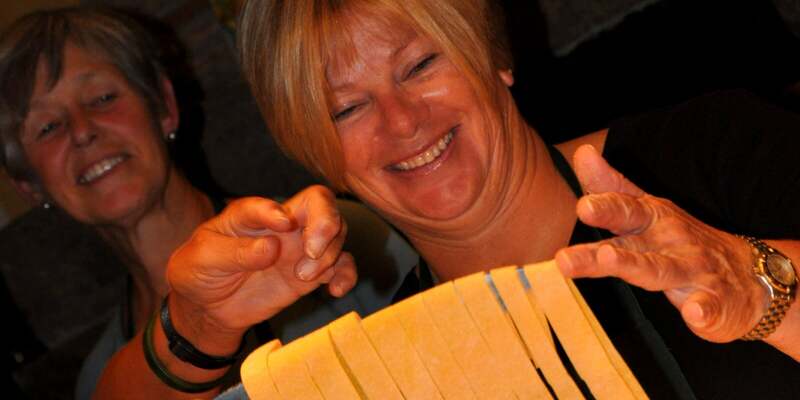 When you look for cooking, culinary and wine vacations in Italy, there is quite a bit to choose from. We are very different in many ways. This has been the most fantastic week!!! It has truly been a highlight of our lives. I will deflintely be booking another experience on Culture Discovery. I read about how we'd be made to feel like family on our trip, and I didn't truly understand it until I experienced it firsthand. We had an amazing group of people on this trip that have become friends. The website said that would happen, but I was skeptical. Enjoyed all the off-the-beaten-path excursions but especially the people...and the laughs! Seamless execution of all the little details. 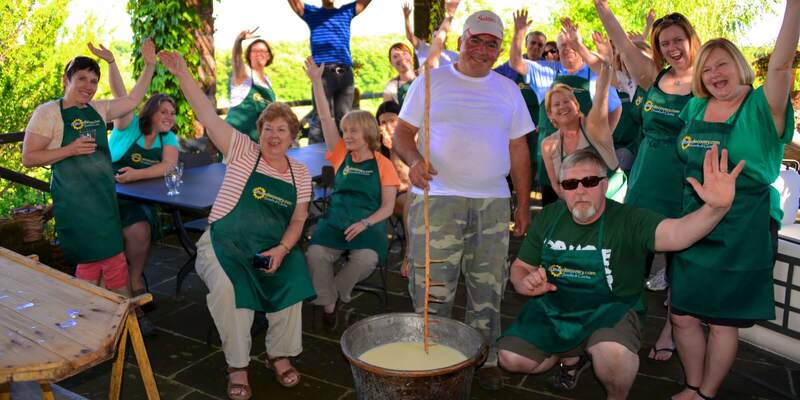 Amazing culinary lessons, enjoying the fruits of our labor afterwards. I would spend another week (or 10) with them ANY time. 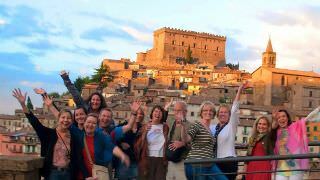 If you want to experience the true culture of Italy and discover places off the beaten path, this is the trip for you.